In a sport where the judging is based solely around subjectivity, how should one handle themselves if they lose? 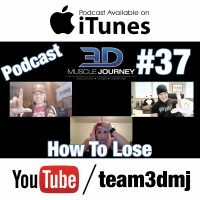 In this week’s episode, Andrea sits down with Brad and Jeff, to recount their most devastating losses. How did they handle them? Was the main source of anger, depression and frustration the result of something external, or was it the result of self-created internal expectations? What do the coaches say to an athlete, when they are sold on getting their pro-card in that specific season? Why is it so important to learn to love your training, rather than just keeping your eye on the prize, and gunning for the win? What importance does being a realist play in your love and longevity for the sport of bodybuilding? All of these topics, plus many more are covered in today’s podcast. Along with being consistent, and doing everything right, from the training, to nutrition, to the supplementation, there is something else that plays as big, if not bigger a factor, in your chance of being happy and successful in this sport. Time. i loved it so much, it gave me a lot of tips to avoid losing in bodybuilding, i will perform the tips and i will write a comment again soon when seeing the result! So happy to hear it! Best of luck, Anny! And yes, please do let s know how it goes! In this post you are very thoughtful . I am very happy to read this post. It’s so motivational post for me. I would like to very thankful for this best and most important information. Thank you so much for letting us know that you enjoyed this episode. 🙂 Glad you liked it!